there were no parks or trails or trees or gardens. and we can now enjoy this beautiful place we call home. along Fall Creek on the way to the old lime kilns. and for the western bluebirds and other creatures that call it home. and the Art and Wine festival and Music in the Park on summer nights. to Lodato, Siltanen and MacDorsa parks in Scotts Valley. Each place is unique and is each one of us. that are exposed in the mountain made of sand. and for the banana slugs, marbled murrelets and red-legged frogs who make it their home. thick with tan oaks, redwoods and madrone. who share the knowledge that in nature life continues. and take time to enjoy these beautiful mountains that we call home. I am fortunate as a garden columnist and landscape designer to be invited to see, stroll and learn about beautiful gardens. Sometimes it’s a particularly successful method of irrigation, plant selection, placement or care that someone wants to share. Other times it’s the story of how their garden evolved. All gardens are interesting in their own way. 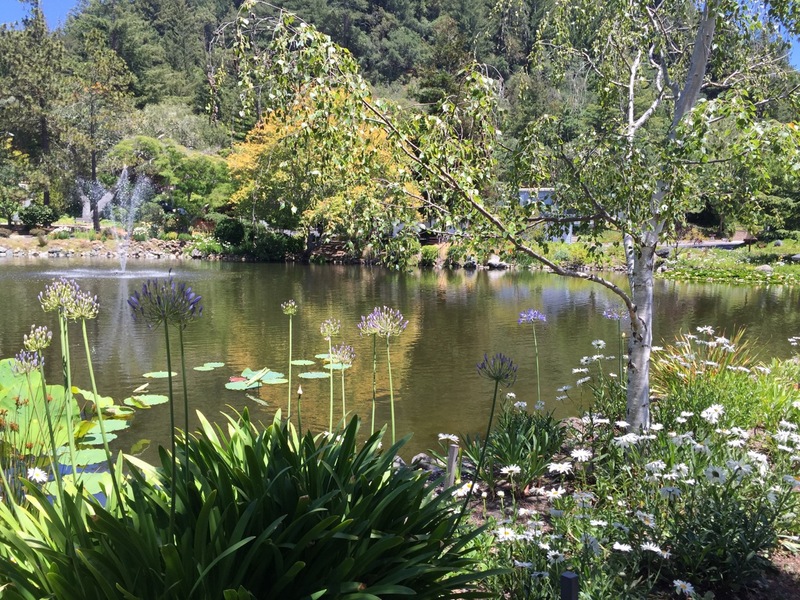 Recently I received an email from a reader in Scotts Valley who wanted to share what Montevalle Park has been doing to save water. Well I jumped at the opportunity to learn more about water.conservation. 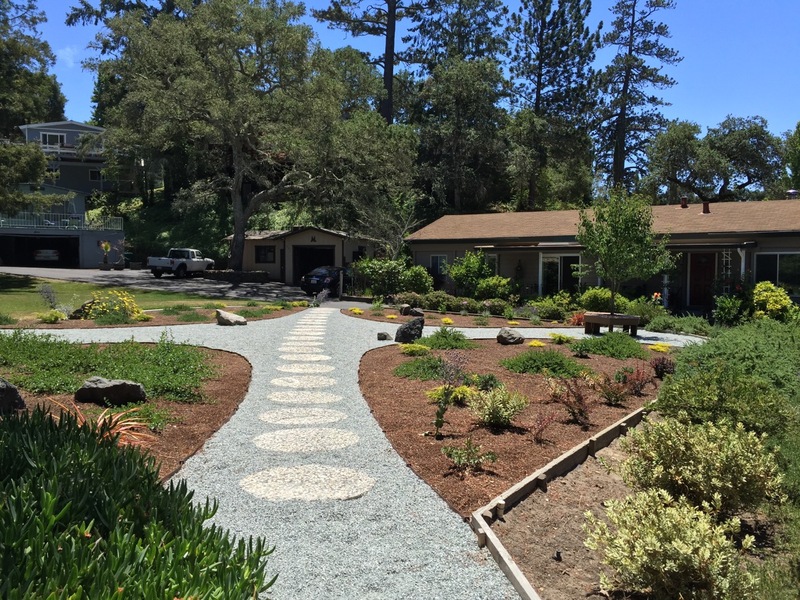 Here is how this unique mobile home park has changed their landscaping to save water. Vickie Birdsall, my host and President of the HOA, welcomed me to her little corner of the world. Officially Montevalle is a mobile home park but is unique in that each lot under the oaks, pines and redwoods is a different size. Vickie told me that back in the early 70’s when Ray Retzlaff developed the park it was the first in California where people could purchase the lot they lived on and collectively own all the amenities. The lots were divided with the trees in mind so that a pre-made home could be installed without disturbing the trees. As you drive through the park on winding roads each homeowner has made their property unique. Many have views of the woods, some with mountain vistas. 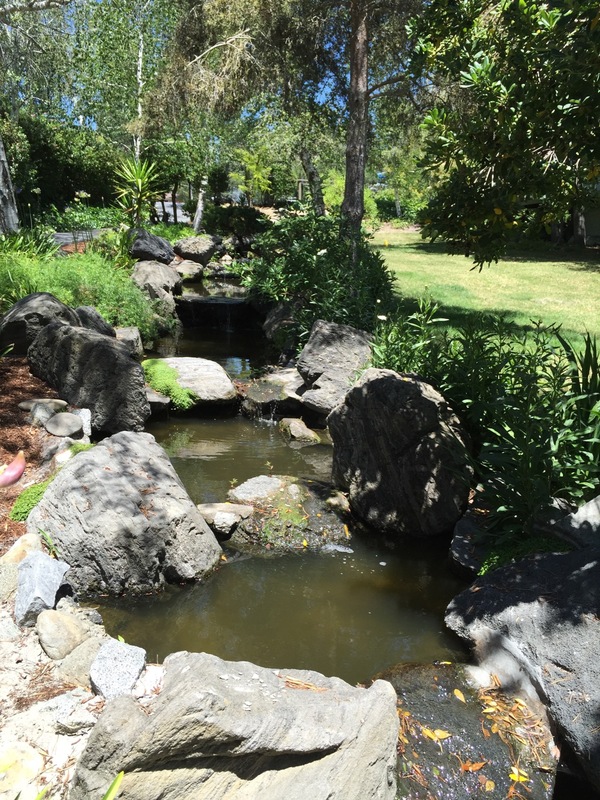 All have established landscaping and enjoy the common areas including 2 lakes connected by a waterfall. Vickie is now the President of the Association but for many years was in charge of the landscaping. She knows about the sandy soil of the park and the well water with its high mineral content that is used for the irrigation. On the positive side the deer seemed to be browsing other neighborhoods these days leaving the park to the occasional fox and the raccoon. There are 56 pocket gardens in common areas throughout the park. Vickie’s goal is to convert as many as possible from lawn to drought tolerant plantings. The putting green area-which is across from Vickie’s house- used to be all lawn. She started taking out the lawn little by little a couple years ago and last fall finished the new landscaping. Incorporating re-purposed stepping stones and feather rock from other places in the park. a new path bisects a lovely garden which will use little water once established. Starting from gallon cans the new plantings are growing in nicely. Vickie told me she uses plants with different textures, foliage colors and heights and repeats the groupings which makes all the elements work together. She was proud to show me how well the Carmel Creeper ceanothus is filling in. Other nearby plants include Little John callistemon, Rose Glow barberry, Golden Sunset coleonema, euphorbia, Emerald Carpet manzanita and Moonshine achillea to name just a few. The real eye catchers are 2 very drought tolerant sea holly. The metallic, iridescent blue flowers and stems of these eryngiums glowed in the afternoon sun. The park has 2 lakes and as we walked along the shore of the lower lake, Vickie pointed where they installed a bio filter area to clean the nitrates from the water flowing down from the north lake. Yellow flag iris, gunnera and tulle grasses help keep the algae down. Several turtles and koi were enjoying the water lilies that have just started to bloom. Vickie has taken out the pockets of lawn along the step ponds connecting the two lakes. Under locust and birch trees, the small waterfalls are bordered by myoporum ground cover, shasta daisies, asparagus ferns, ornamental grasses and agapanthus. The new plantings are thriving under lots of mulch and are much easier to maintain. 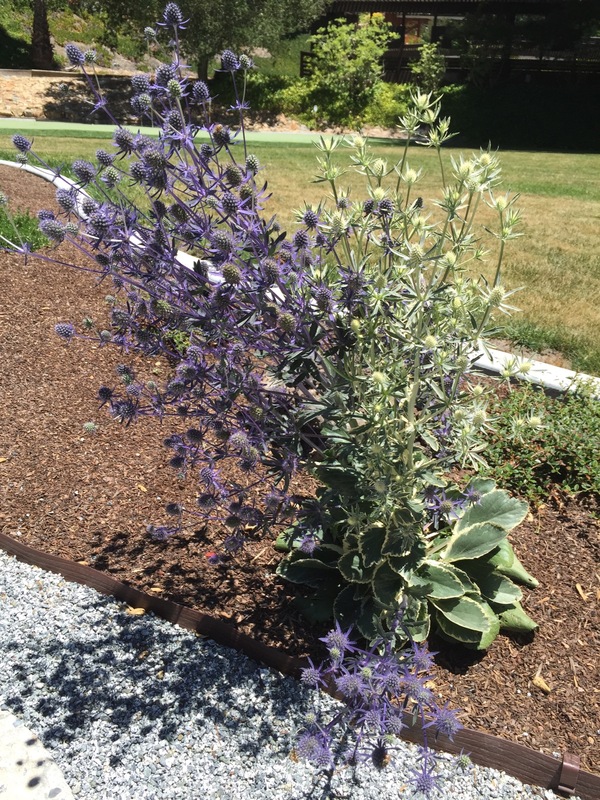 Along the road to the lodge, Vickie pointed out more drought tolerant plantings which have replaced lawn such as Jerusalem sage, Pride of Madeira, manzanita, ornamental grasses and Purple-leafed hop bush. At the lodge she has installed small areas of artificial turf for barbecues and the front garden is a work in progress converting the lawn to dymondia and other plantings. The gophers are not helping with the progress, she admitted. Vickie says she started converting the lawns in the park way before the drought. She has done 10 so far and has plans for many more. Montevalle park is a good example of how an area can still be beautiful and serene without all the lawns. With lots of soil amendment and mulch the new plants bring lots of color plus birds and butterflies using a fraction of the water that was used previously. I was invited back to see the pink lotus blooming in the north lake in July and August. I’ve put it on my calendar.